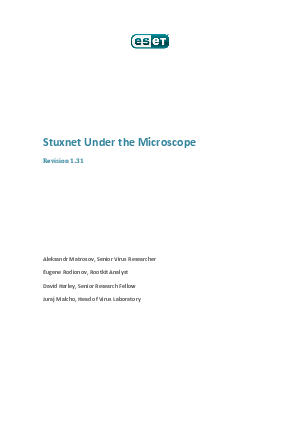 The Stuxnet Under the Microscope has been updated to add pointers to additional resources, and this is probably the last update of the document. However, any further relevant resources will be added to a list here. Aleksandr Matrosov and Eugene Rodionov, the main authors of the Stuxnet analysis, contributed an article to Virus Bulletin on the TDSS rootkit's file system. Until now Rooting about in TDSS was only available to VB subscribers, but it too is now available on the ESET white papers page. Copyright is held by Virus Bulletin Ltd, but the article is made available here for personal use free of charge, by kind permission of Virus Bulletin.